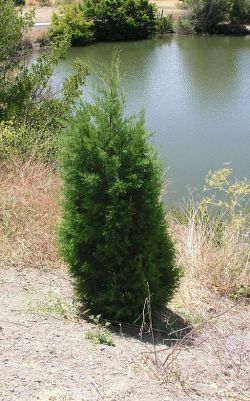 Comments: Evergreen conifer native to small groves in Santa Cruz and San Mateo Counties in California. This species has small scale-like dark green needles held tight to upward pointing branchlets, small globular cones, and red scaley bark. As with most cypresses, this species is conical in youth, but broadens as it ages. Mature height to 75 feet. This species is listed as endangered due to its restricted native habitat.